The Upper Peak Forest Canal mostly follows the course of the river Goyt upstream along its left bank. It is on an embankment for much of the way and commanding views of Kinder Scout are presented to the east, this being a high windswept upland gritstone plateau, most of which stands at about 1,969 feet above sea level, the highest point being Crowden Head at 2,070 feet. Ahead of Newtown, the canal turns southwards to ultimately arrive at Whaley Bridge Junction in Bridgemont where it divides. The main line makes a 90° turn to the east while the Whaley Bridge Branch continues southwards to its terminus at Whaley Bridge Basin. On leaving the junction, the main line passes beneath a footbridge and then crosses Bridgemont Aqueduct to enter Black Brook Valley and on to the canal terminus at Bugsworth Basin. 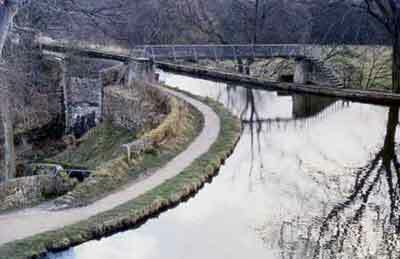 Referring to the map below; the Goyt arch, horse subway and canal retaining walls linking the two structures create a distinct aqueduct, with an arch at each end, known as Bridgemont Aqueduct. Other features of interest in the vicinity of Whaley Bridge Junction include two stop places, Bings Wood overflow weir and Roots Wharf, the latter being on the Whaley Bridge Branch. Etchell’s Stop Place is sited just before the junction and Bings Wood Stop Place is on the far side of the river Goyt but this was destroyed when the Whaley-Chapel by-pass was constructed in the 1980s. Stop planks could be inserted across the canal at these stop places to enable sections of canal to be drained for maintenance purposes. Bings Wood overflow weir was provided to allow excess water in the canal to run off into the river Goyt and so reduce the risk of a breach. Roots Wharf is on the offside of the Whaley Bridge Branch between the canal and the road. Coal from Railway Pit on the opposite side of the road was loaded into boats at this wharf. 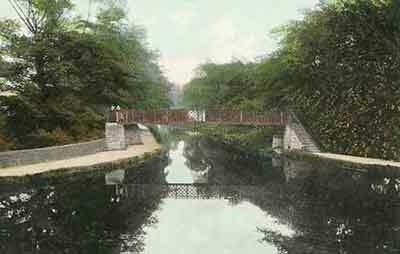 This feature was destroyed in 1998 when a bridge was built across the canal to access a Tesco supermarket. Etchell’s Stop Place, 4 chains. Warksmoor Wharf, Newtown, 1mile 77 chains. Marple Junction and connection with the Macclesfield Canal, 5 miles 75 chains. Start of the Peak Forest Canal at Ashton Junction, Dukinfield, 14 miles 4 chains. Whaley Bridge Junction Footbridge and Horse Subway, 2 chains. 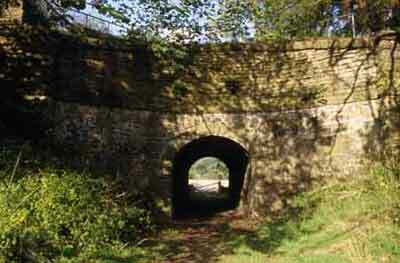 Aqueduct arch over the river Goyt, 7 chains. Bings Wood Stop Place, 11 chains. Britannia Mill (cotton), 20 chains. This mill is no longer extant. Gauging Stop Place at the entrance to Bugsworth Basin, 31 chains. Chinley Road Bridge at Bugsworth Basin, 51 chains. 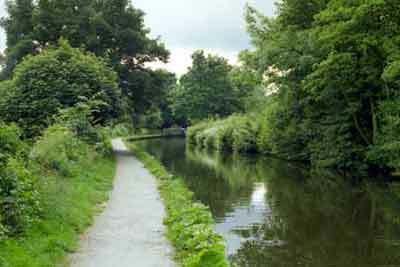 Terminus of the Peak Forest Canal adjoining the Navigation Inn, 56 chains. Roots Wharf on offside of canal for Railway Pit, 15 chains. Canal Company’s Wharf and Warehouse at Whaley Bridge Basin, 34 chains. Beneath the footbridge, the main line of the canal crosses Bridgemont Aqueduct and proceeds to its terminus at Bugsworth Basin. Behind the viewpoint is to Marple Junction and the Whaley Bridge Branch is off the picture on the right. The deeply curved face of the horse subway can be seen to the left of the footbridge. 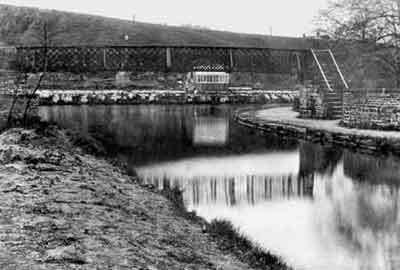 Whaley Bridge Junction looking east along Bridgemont Aqueduct towards Bugsworth Basin, early 20th century. Left is to Marple Junction and right is to Whaley Bridge along the Whaley Bridge Branch. Whaley Bridge Junction looking west from Bridgemont Aqueduct, early 20th century. Right is to Marple Junction and left is to Whaley Bridge along the Whaley Bridge Branch. The horse subway at the western end of Bridgemont Aqueduct looking north, 1980s. 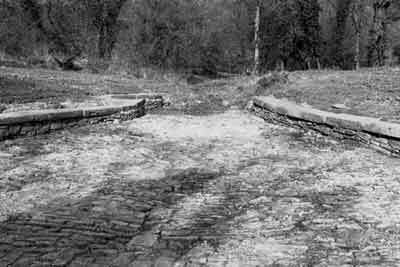 It was provided to allow horses hauling boats along the Whaley Bridge Branch to pass beneath the main line of the canal. Note the footbridge in the top left-hand corner. Grade II listed with the name Horse Tunnel, List Entry No. 1249858. Date first listed, 10 February 1995. 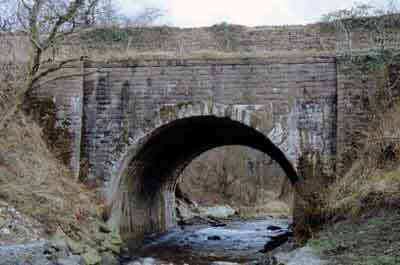 The Goyt Arch at the eastern end of Bridgemont Aqueduct looking south, February 1980. Etchells' Stop Place looking north, 24 March 1979. This stop place is named after Thomas Etchells who, in the 1850s, was the occupier of two properties on the opposite side of the turnpike. It is understood that he was a coal miner. Bings Wood Stop Place looking west, 5 April 1980. 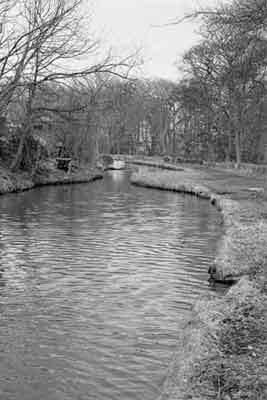 In 1980 this was the head of navigation on the main line as Bugsworth Basin was still undergoing restoration. 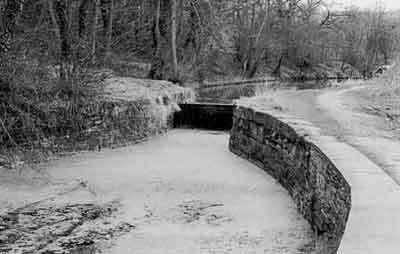 Bings Wood overflow weir, 22 March 1998. Roots Wharf, Whaley Bridge Branch, 10 October 1998. The overgrown wharf is on the right, identified by the gap between the trees. Coal from Railway Pit on the opposite side of the road was loaded into boats at this wharf.